The faint smell of old cigarette smoke surrounds members of the audience in the Campus Theater as they watch former professional soccer player Abby Wambach discuss the pay discrepancy between the U.S men’s and women’s soccer teams. About 10 minutes later, staggered gasps fill the room as the movie displays statistics of how black people are judged more harshly by the justice system than white people. The movie on the screen is “Bias,” a journey by director Robin Hauser to uncover the cause of various biases, and it is one of the many films being shown throughout the five-day festival in its fifth year. The Denton Black Film festival, branded DBFF on the sleek black and color-accented flyers, brochures and posters popping up all around Denton, was created in 2014 based on an idea from Harry Eady, the festival’s director. The festival is all about giving back to the community, both through exhibiting underrated independent art and by donating funds from the festival to the Denton African American Scholarship Foundation. 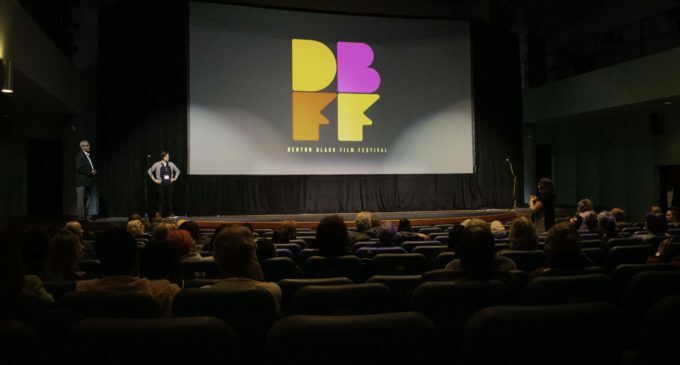 This year, the DBFF continued to expand beyond films to include a wider selection of art like poetry and music, the latter being steered by DBFF’s musical director Frederick “Nick” Nichelson. Nichelson is the founder and bass player of jazz band Fingerprints, and since he first got involved as the musical director in the festival’s first year, he has seen the festival grow from a one-day local event to a five-day event featuring 64 films, drawing filmmakers from various parts of the country. Nichelson views the DBFF as an opportunity for Denton residents who have not yet immersed themselves in the city to explore the rich history that exists beyond UNT. Masterjam director James Curry speaks at the mental health panel on Friday, Jan. 25 with Dr. Felicia Fisher and moderator Carla Carter. Image by Ashley Gallegos. 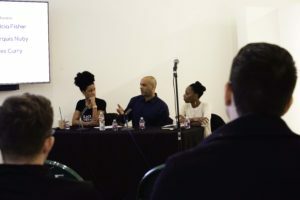 The third and fourth days of the festival, which occurred on Jan. 25 and 26, featured panels in the midst of the ongoing film screenings. On the 25th, a mental health panel was held at UNT on the Square, centering the discussion around director James Curry’s film “Masterjam,” which was inspired by his brother’s suicide. Curry and fellow panelists Dr. Felicia Fisher, Dr. Marquis Nuby and moderator Carla Carter discussed the stigma of mental health in the black community as well as ways to encourage speaking out about and getting help for mental health issues. Fear of judgment and being ignored contributes to those in the black community’s hesitance to discuss when they are struggling with issues such as depression or anxiety. Curry thinks changing the language that surrounds these topics is necessary to make things better and take the guilt that many people feel out of the equation. The most heavily discussed issue was the family’s role in assisting a loved one dealing with mental health issues. Fisher spoke about how vital it is for family members to exhibit compassion toward the person who is struggling, while also taking care of their own mental health. She also stressed the importance of representation among mental health professionals who can relate to issues specific to black people. “Have an obligation to be present within the community to show that people that look like you are here to help people that look like you,” Fisher said. Fisher says that therapy is something one can never be too young for and suggests that children speak to a therapist at around age 5 or 6. Fisher and Carter expressed how they are impacted by the intersection of black women in regards to the mental health conversation. They recommended resources like therapy for black girls and melanin therapy for black women seeking counseling from a black professional. Carter particular dislikes the stereotype of the “strong black woman” that is prevalent in society. Dr. Marquis Nuby, a local pediatrician, feels that money is often a roadblock in achieving good mental health because of the expenses that accompany treatment. He links this to voting for representatives who will advocate for more affordable mental healthcare. Festival-goers attend the “Women, Wine and Wisdom” event for the festival. 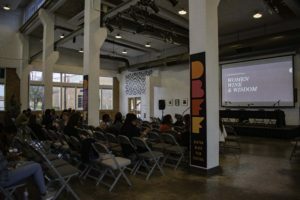 This event featured a panel in which women in the film industry were able to discuss the roles women have in it as creatives. Image by Ashley Gallegos. On Saturday night, festival-goers gathered at Denton’s Patterson-Appleton Center for a panel about all things related to women in film, appropriately titled “Women, Wine and Wisdom,” as it began with a cocktail party. Christie Herring, Amy Adrion, Patty Newton and Justina Walford spoke about their experiences in the entertainment industry as women, as well as the issue of diversity in film. Herring, editor and producer of the film “Bias,” which screened Friday afternoon at the Campus Theater, said that the “like me” bias exists when people favor others who look like them. When the topic of the #MeToo movement entered the discussion, the women shared personal experiences they had with discrimination in their industry. Considering all the progress the movement has made, Adrion believes there is still a long way to go and misconduct in the industry continues. Featured Image: Christie Herring, producer and editor of the movie “Bias,” speaks to the audience and answers questions at the Q&A after the documentary feature was shown. Image by: Ashley Gallegos. 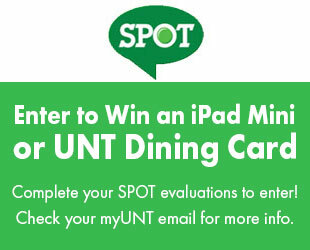 Glad to have you be a part!